Back in time to 1955, and this caption was broadcast by the ITA during tests for the forthcoming ITV. "Reception Reports may be sent to :- ITA Eng. Div. 14 Princes Gate, London SW7"
"The wavy line is to show up delayed images (Ghosts) which may appear on the black or white strips. The dots enable an estimate of the delay distances to be made." 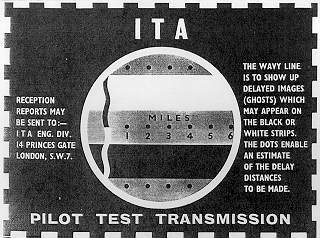 One of the earliest ITA Tuning Signals / Test Cards. 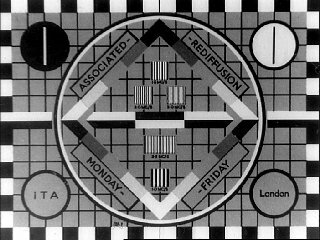 It was used from 1955, and is based upon the classic Test Card C, although greatly simplified. As with most ITA cards, there were numerous variants for different regions and transmitters. 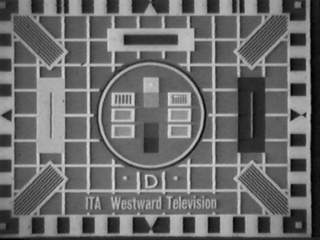 Another early ITA test card, this one is an Associated Rediffusion version. 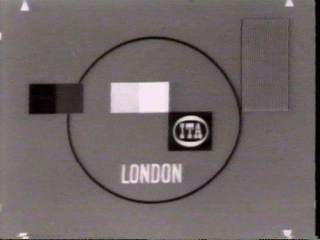 This is probably the most complex test card used exclusively by the ITA. 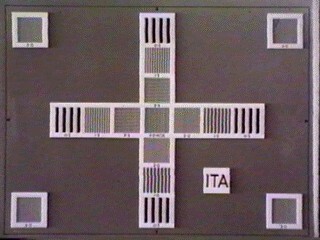 Another early ITA test card, consisting purely of frequency gratings in a cross layout. Not sure when this was in use. Independent Television Programmes will commence this autumn on Channel 10 from the new ITA Transmitting Station at Emley Moor. This is a Pilot Transmission on low power to help dealers install band III aerials and adjust sets now, and so reduce delays and disappointments when programmes begin. Another tuning signal, another ITA logo. 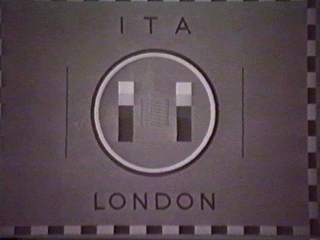 The ITA seem to have changed their logo often during the '50s and '60s. By the time they had settled on this one, they were soon to change into the IBA. The IBA took on the same basic logo and kept it for the next 20 odd years. Harlech, now known as HTV present the famous ITA "Picasso" tuning signal. Used extensively during the 1960's, it was to be seen in every region prior to start-up, around 9.30 in the morning. 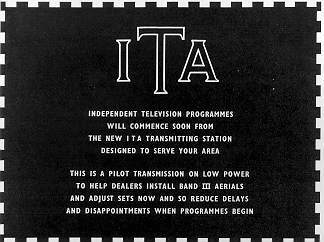 This basic design was available in numerous variants, for each ITA company and transmitter, only the caption changed. 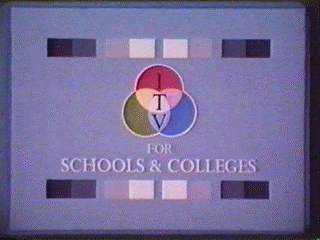 The ITV Schools logo from 1969 onwards. The logo bears a passing resemblance to the ATV colour logo, which is unsurprising as schools programmes were networked from ATV in the beginning. Early ITA caption shown before Thames started in the morning. 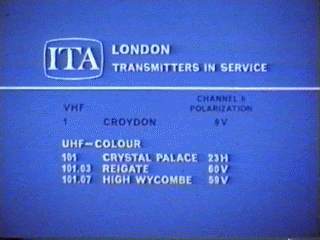 The 405 line service from Croydon is the same site as the new Channel 5 service. 101 is the main transmitter, 101.03 and 101.07 are the dependent relays. Similar caption, once the IBA had taken over. They didn't spend a fortune on new logos then! 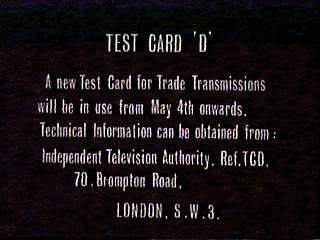 The ITA used Test Card C, and were keenly looking forward to card D, as this caption broadcast as part of the Trade Test Transmissions demonstrates. And this is what it looked like when it finally arrived, this is the Westward regional variant. 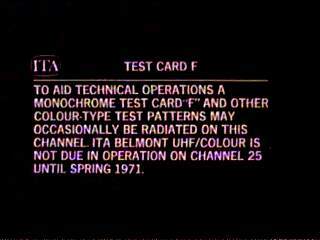 The introduction of Test Card F to the ITA network caused some confusion. 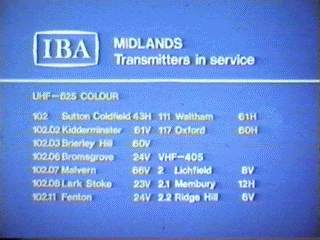 TCF was a 625 line Colour card, but colour didn't come to the ITA stations until 1969. The rollout of colour took some time, the last mainland station going colour in 1971/72. The Channel Islands were even later, not receiving colour until 1976. 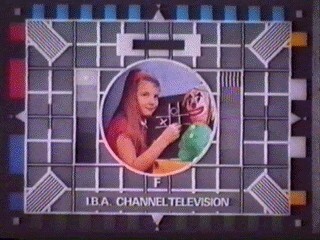 Test Card F, as seen in the Channel Islands. Channel Television were the last ITV region to be converted to colour, 625 line services from Fremont Point did not begin until 1976. Does anyone know what test card was in use in the early seventies? 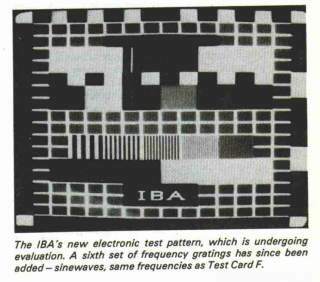 1978, and an early draft of the IBA's new electronic test card, ETP-1 (Electronic Test Pattern). As the captions states, an extra set of frequency gratings was added to the final version. 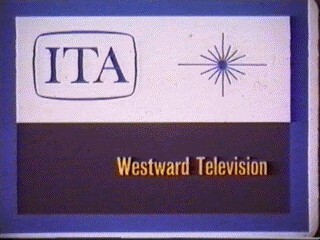 The ITV version had just "IBA" as identification as above. With the launch of S4C and Channel 4, different identification was used. 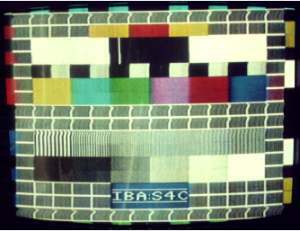 A Channel 4 Test Card, from 1992. 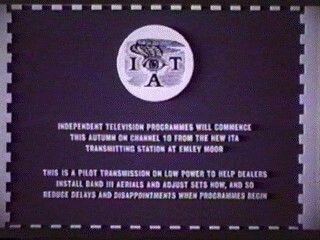 ETP-1 was frequently used by the IBA for transmission on both Channel 4 and ITV prior to the latter going 24 hour. Channel 4 have also gone 24 hour so we have now seen the last of this test card. 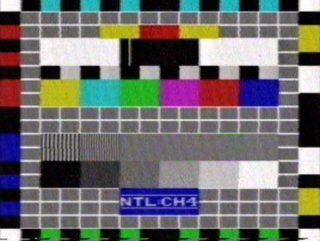 The lines above and below the NTL:CH4 signified that the image was from the CH4 presentation department, whereas the lack of lines meant that it was generated locally at the transmitter.